Never heard of it? Don’t fret: until Friday, nobody else had either. The canned product just recently surfaced on the Tumblr of a Microsoft design employee. The blog was quickly deleted, but not before the Moonraker’s mock-up marketing images made the rounds: we’re looking at a standard, square-faced smartwatch with rounded corners, brightly colored wrist-bands and a Metro-inspired Windows interface. Rumor has it that Nokia was shopping the wearable around at Mobile World Congress last year, but didn’t go anywhere. 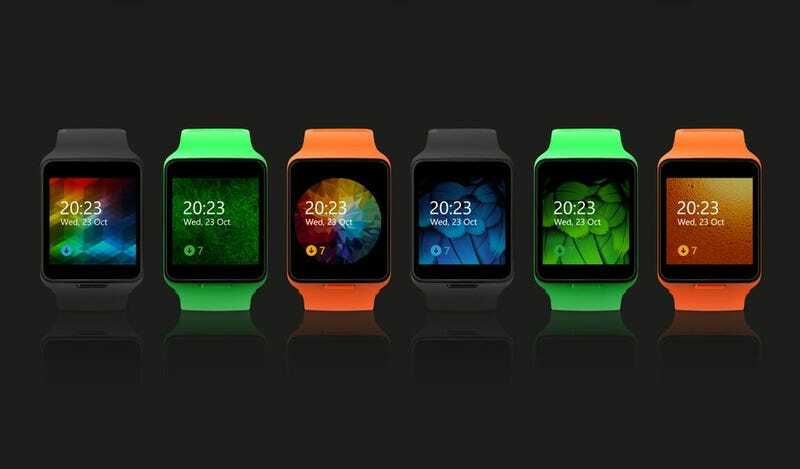 Sometime after Microsoft bought the company, the Moonraker was killed to put more focus on Microsoft’s band, which had more sensors and tracking features, but a less robust watch interface. The specifics are hard to guess at, but from these images, we can at least tell that Moonraker could make calls, receive texts and emails, count steps, listen to the radio and run a Facebook app. The mock-up also has a camera remote feature—perhaps for selfie-stick shutter control? As cool as this window into what might have been is, I think Microsoft made the right choice. Moonraker looks a lot like every other smartwatch out there without doing anything to make itself stand out. The Microsoft Band was, at least, unique.